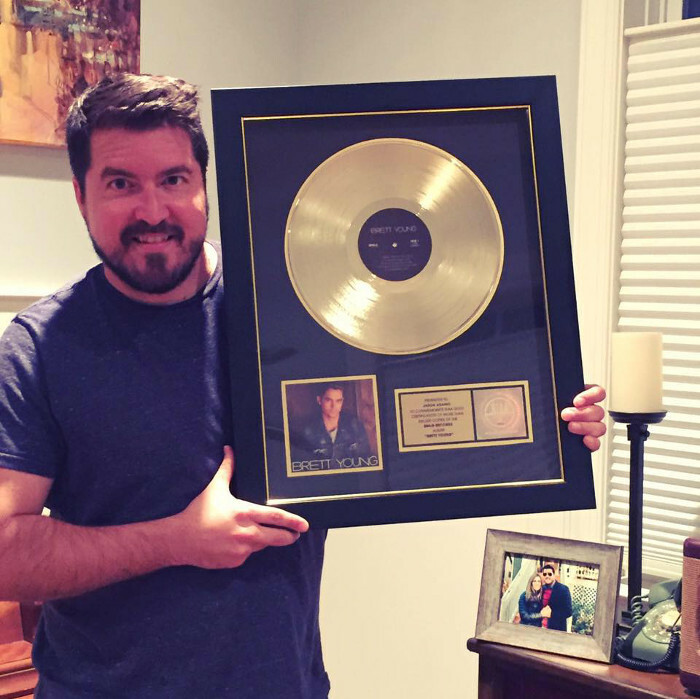 Jason Adamo receives first gold record as a songwriter on country artist Brett Young's debut album. In July of 2013, I moved to Nashville and started co-writing songs with many different artists there. In January of 2014 my friend Brett Young, who I had met in 2011 in Los Angeles, moved to Nashville as well. Brett and I played a few songwriters rounds together throughout those first couple of months. Brett called one day to see if I wanted to head to a No. 1 party for David Nail’s song “Whatever She’s Got”. It’s no secret that most songs in country music that top the billboard charts are actually not written by the artists who sing them, but rather another songwriter or two or three. Brett and I found Nite’s story to be very inspirational and knowing that we had scheduled a writing session together the next day we decided we would have to try to write a song about Nite’s story. When Brett’s earlier songwriting session ran late we combined our writing session with his previously scheduled session with Annie Wildgen (who I had become friends with when I first moved to Nashville). Within two hours we had the majority of “Beautiful Believer” written and soon after were recording a demo of it at my house tin Nashville. Brett went on to record his first version of the song on a self-produced EP “California Country” (2015) Shortly after the release of that EP, Brett signed a record deal with Big Machine Label Group and “Beautiful Believer” would be appearing on his debut record. Released in February of 2017, Brett’s album went RIAA Gold Certified in the Fall of 2017 giving myself and Annie Wildgen the opportunity to have a song we co-wrote on a gold record which is pretty cool.